Introducing Perfectil Platinum - the revolutionary new beauty supplement to help keep skin looking radiant, youthful and glowing. Perfectil Platinum takes the science of beauty to the next level with a specialist formula comprising of bio-active nutrients which can play a vital role in helping to protect ageing skin. Perfectil Platinum helps refine, nourish and protect ageing skin by delivering a powerful combination of bio-active ingredients including high-grade marine collagen complex, pine bark extract, black currant seed oil, lycopene and alpha-lipoic acid directly to the lower layer of the skin. Optimum nutritional support for skin is of greater importance than the most expensive creams and moisturisers because the benefits are delivered via the blood stream, at the deepest and most effective level. 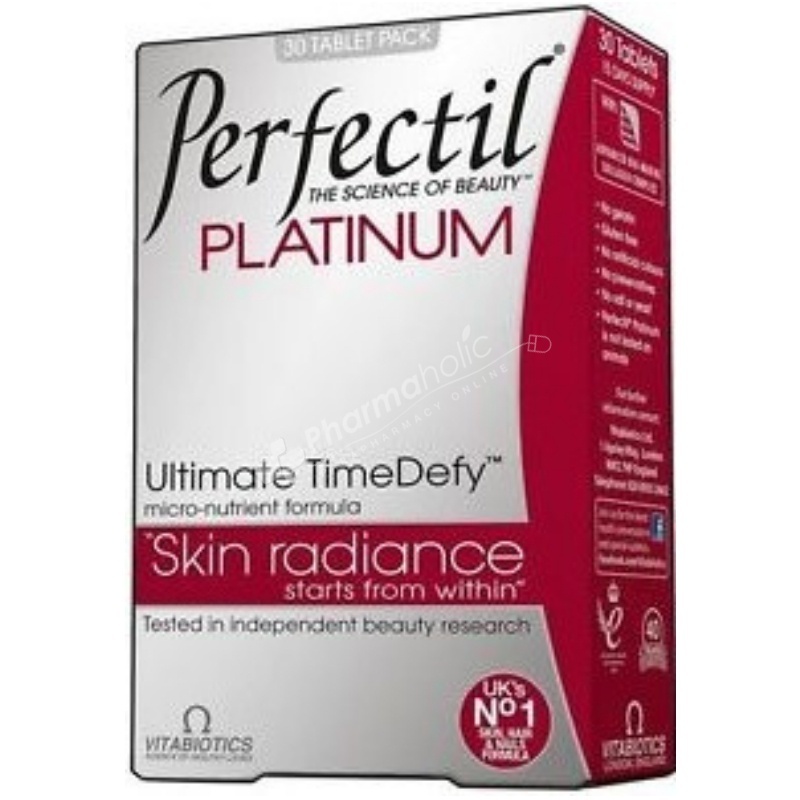 Perfectil Platinum’s nutrients work in synergy to help support the biochemical processes of skin metabolism and repair. Gelatin Free, Gluten Free, No artifical colours, No preservatives, No salt, No yeast. Perfectil Platinum is suitable for vegetarians. (Maltodextrin), Bio-Marine Fish Collagen (Cartidea), Bulking Agent (Microcrystalline Cellulose), Magnesium Oxide, Anti-Caking Agents (Silicon Dioxide, Stearic Acid, Magnesium Stearate), Vitamin C (Ascorbic Acid), Vitamin E Natural Source (D-Alpha Tocopheryl Succinate), Natural Mixed Carotenoids (Soyabean Oil, Antioxidant Acid, Betacarotene), Pantothenic Acid (as Calcium Salt), Tablet Coating (Hydroxypropylmethylcellulose, Microcrystalline Cellulose, Natural Source Colours Dioxide, Red Iron Oxide, Mono and Diglycerides of edible fatty acids), Blackcurrant Seed Oil Powder (Starch, Maltodextrin, Antioxidants Palmitate, Mixed Natural Tocopherol - from Soya), Zinc Sulphate, Purified Sea Kelp Extract, Alpha Lipoic Acid, Ferrous Fumarate, Vitamin B12 (Cyanocobalamin), Niacin (as Nicotinamide), Cysteine, Standardised Green Tea Extract, Thiamin (Vitamin B1 Mononitrate), Vitamin B6 (as HCI), Grape Seed Extract, Lycopene Extract, Pine Bark Extract, Vitamin D3 (Cholecalciferol prep. ), Riboflavin (Vitamin B2), Co-Enzyme Q10, Copper Sulphate, Manganese Sulphate, Folacin (as Folic Acid), Sodium Selenate, Chromium Trichloride, Biotin. Perfectil® does not contain any drugs or hormones and is produced in accordance to GMP standards of quality control, beyond those normally required for food supplements. Always see pack before use for full information and directions. Do not exceed the recommended intake. As with other food supplements seek professional advice before using if you are pregnant, breastfeeding or suffer from food allergies, and consult your doctor or pharmacist if you have an underlying medical condition or if on medication. Do not take if you are allergic to soya. This product contains iron, which if taken in excess may be harmful to very young children. Vitamin supplements are not intended to treat or prevent any disease. Food supplements must not replace a balanced and varied diet, and a healthy lifestyle.